healthy heart rice recipes. Being highly processed and rich in carbohydrates, rice is usually avoided by those with heart problems. However, for most people, a meal never seems complete without rice. Worry not! Here is a collection of sumptuous rice, biryani and khichdi recipes made using brown rice, which can be comfortably enjoyed in limited quantities. Not only that, these delectable recipes are loaded with veggies to boost the fibre, which helps to keep cholesterol in check. There are also some satiating variants made using heart-friendly cereals like buckwheat, oats and whole wheat. Go ahead and explore this section to discover your favourite dishes in a heart-friendly version. Are you bored of eating the same old khichdi? If you want to make your khichdi exciting then try your hands on Gehun ki Bikaneri Khichdi a masaledaar khichdi which is sure to excite your taste buds. Get more innovative in cooking by adding a variety of vegetables in your khichdi just like our Buckwheat Moong and Vegetable Khichdi, adding buckwheat and fibre rich vegetables decreases the glycemic index of the recipe which is required for healthy heart. Load your khichdi with proteins by adding high quality protein ingredients like curds and paneer. Vitamin Khichdi is one such recipe which has both curds and paneer both of which make it protein packed. It is also a good source of magnesium which is a mineral required for proper functioning of the heart muscles. When beans are sprouted there is increase in its digestibility and the nutrient content is also enhanced, thus making it a must have in your daily diet. Sprouts Pulao can be had safely by persons who suffer from flatulence, the only thing that needs to be kept in mind is that the sprouting is done properly and you are good to go. Everyone is fascinated by colorful food and green colour is the most soothing to our eyes. Try this Green Peas and Mint Pulao, a recipe with minimal spices and low in cholesterol. The green colour will soothe your eyes while minty taste gives pleasure to your taste buds. Give a treat of fibre to your tummy with this Cabbage Pulao which has a south indian flavour and the chana dal in it adds on to the protein value, the quantity of rice compared to cabbage is low to make it healthier and fibre rich. Who said veg biryanis do not taste good? I’m sure whoever must have said has not tried our recipe for Paneer Mutter Biryani which tastes just heavenly with the vegetarians meat Paneer, it is loaded with calcium and good quality protein. Combining beans with cereals increases the protein quality of the recipe and you can do this by making Kabuli Chana Biryani which is sure to tickle your taste buds along with providing heart health benefits as it is rich in fibre and low in cholesterol. You may have heard of masoor pulao but did you ever try making biryani with it? Masoor Biryani is prepared using brown rice and masoor dal which not only makes it fibre rich but also amazingly tasty, use minimal ghee/oil to make it heart friendly. 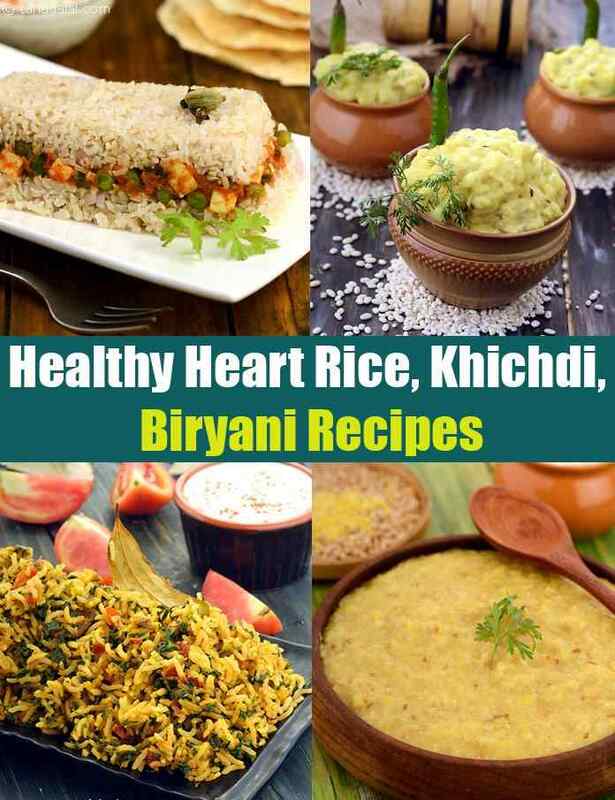 Enjoy our healthy heart rice recipes other healthy heart recipes articles below.